I love Pinterest, don’t you? It is a constant source of inspiration in just about anything you could think of. And when it comes to recipes… amazing! 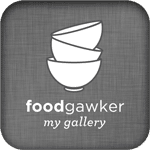 I have found so many great recipes and cooking/ baking blogs here. And lately so many salads including fresh fruit. I love that, I made some during the last years but really not as many as I could have. This salad is also inspired by a recipe found on Pinterest. It is from Feasting at Home. I changed it quite a lot but still, I would have probably not thought of anything like it on my own. But it worked great: the hearty quinoa, the fresh fruit and especially the herbs. I used a lot of mint, some parsley and coriander. I also love the addition of lemon juice in the salad, I added just a little in the beginning but then more and more as I started adjusting the taste, I love salads to be a bit tangy and lemon just worked perfectly with the sweet fruit. 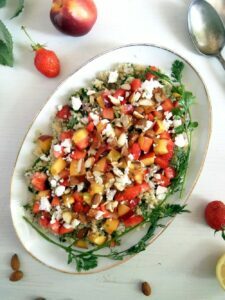 Just be sure to use really ripen, good quality strawberries and nectarines, the salad relies a lot on their sweetness and flavor. And lots and lots of herbs. I used a mirabelle plum white wine vinegar because I happened to have that and thought it would go well in this salad. It did, but if you don’t have any, just use plain white wine vinegar or raspberry vinegar for instance. I can imagine that balsamic vinegar would also be great combined with the strawberries. I also entered this salad to No Croutons Required, the July edition of Vegetarian Soups and Salads, a monthly food blogging event alternately hosted by Lisa’s Kitchen and Tinned Tomatoes. Cook the quinoa according to the packet's instructions. Drain thoroughly, leave to cool completely and chill until ready to use. Toast the almonds in a small pan without adding any fat. Leave to cool completely and chop roughly. Chop the shallots and the herbs very finely. Place the quinoa, shallots and herbs in a bowl and add the olive oil, white wine vinegar and about 1 teaspoon lemon zest, salt and pepper to taste. Add 1 tablespoon lemon juice. Chop the strawberries and nectarine into small pieces. Add to the salad and mix very gently, taking care not to crush the fruit. Adjust the taste with more lemon juice, salt and pepper. Arrange the salad on a platter. Sprinkle it with the toasted almonds and crumbled feta cheese. Actually, I never like boiled or baked. My girlfriend then told me about your webside. After trying out some of your recipes, I am absolutely thrilled! You describe the procedure so extensive, that the cook and bake is allready very simpel. But the best part is, that everything is very tasty! Thank you so much, Adina! ! Thanks for linking to me. 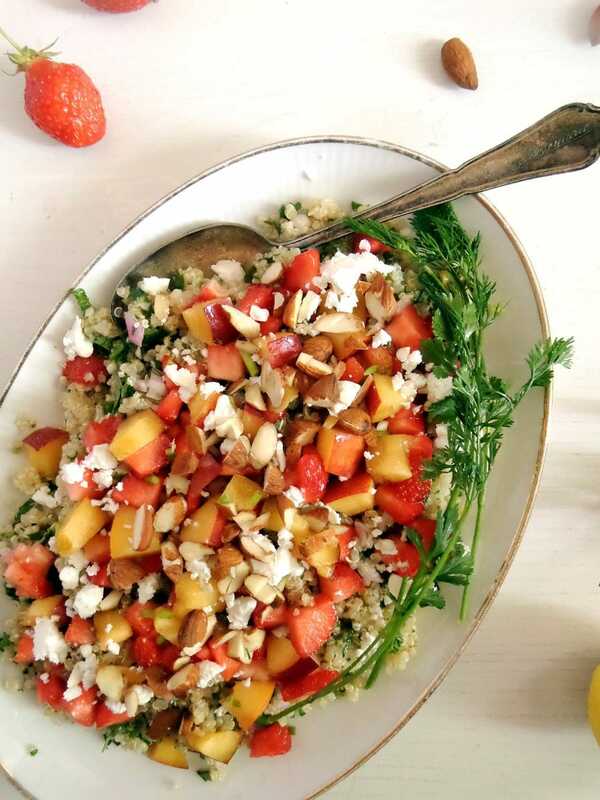 Your Strawberry, Nectarine, and Quinoa salad looks delicious! I bet it has a nuttiness thatI love! What a beautiful summer salad! I adore the combo of flavours. Delicious combination of flavors here. Thanks so much for sharing with NCR.